Today’s free web design resource is a pack of four Bootstrap navbar menu templates. They are very simple and come with a logo section on the left and a links / buttons section on the right. 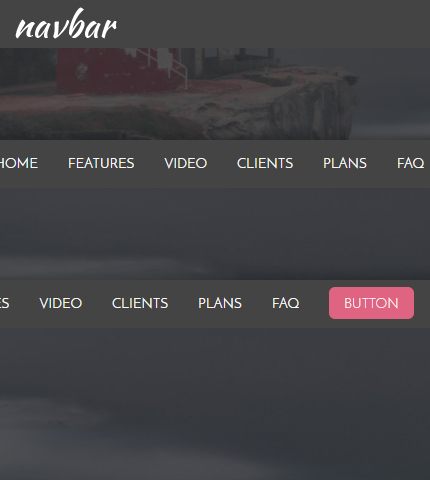 The templates come with different designs and animations, and are based on the default Bootstrap’s navbar component. You can use them as a starting point to create the header section and the top menu of your next website project. Continue reading below to find the live preview and download links. Enjoy! Fixed top dark navbar with animation. Fixed top light navbar with animation. Download the zip package below and extract it. Each template / layout is in its own folder called “layout 1”, “layout 2” and so on. and this tutorial: How To Quickly Create a Beautiful Top Menu in Bootstrap 4. This always confuses me. What constitutes ‘enough word’ – a tweet? How can you change the background color from layout No 3. when scrolled down?